Making money from a podcast is reserved for those with like, 1,500,000 downloads a month right? NO. NOT IN THE LEAST. In part 2 of this “how to start a killer podcast” series, I’m joined by Carrie from the Hippocratic Hustle podcast to talk all things starting and EARLY monetization. Enjoy! Is this John Lee Dumas or Tim Ferriss level money? Not only is it POSSIBLE to monetize a podcast from the very beginning, I’ve personally found it much easier than monetizing a blog. This post is going to show you how. That’s crazy. Let’s dig in. 1 – More and more people “understand” what it entails. When you pitch folks for blog or YouTube sponsorships–it’s not mainstream enough yet to really be understood. But anybody that listens to podcasts (50% of Americans) know that sponsorships are how podcasts are monetized. 95% of popular podcasts have live-reads. It’s not really “live” for most podcasts, but it just means an audio advertisement. 2 – You can start small. We’ll talk more about this in a minute, but it’s obviously easier to land a $50 sponsorship than it is a $500 sponsorship. (or is it? More in a sec). 3 – Audio is superior to text when it comes to authority and brand-building. When you read “I fully recommend Freshbooks” on my blog post, that could even be copy/pasted from some Freshbooks partnership manager. But when you hear my voice whispering in your ear while you’re washing dishes in your underwear–telling you how awesome Freshbooks is–it’s a different experience. Sincerity and authenticity shine through in audio. It’s a podcaster’s weapon. Have you seen guidelines like this? Um no. We’re not Art of Charm. Feel free to use CPM models when you reach 10M downloads a month. Until then, these models are stupid and limiting, and can EASILY be overcome with a bit of creativity and hustle. Carrie got $75 an episode. Per these “standards,” that would mean she’d require roughly 3,000 downloads an episode. Here’s Exactly How to Monetize a Podcast From Day One. Step 1 – List out all the different ways you can add value. Remember what we said about live reads? What do live reads really offer sponsors? Never, in the history of podcast sponsorships has anybody dropped what they’re doing to rush to a laptop and check out a sponsor. That’s why we MUST offer more than just live-reads! If you’re looking to make money in month one, with small download stats, you’re going to need to list out more ways to add value. The full template is available below by the way. So step 1? List out all the ways you can add value! Even if you don’t have tons of downloads, traffic, Twitter followers, etc–it can add up. Wear their t-shirt every day for a month. Get creative and find ways to add value top every sponsorship. Blow them away. Step 2 – Find a very specific person/brand you can add value to. So you’ve got a few ways you can help a brand–but what brand? The next step in the process is to investigate your audience, and your authority/expertise, and then create a small list of targeted sponsor prospects. To be able to show a sponsor how your podcast topic and target listeners can benefit THEIR brand. What do I mean by “brand?” What type of entities routinely sponsor podcasts? This could be anything from Fortune 100 companies to tech startups to small local businesses to other bloggers–as long as they have one small trait: They want to grow their business and are willing to invest some amount of cash to do so. The people you target MUST have that trait. So where should you start? Who should you target first? Small businesses, fresh startups, or bloggers. When Carrie started her podcast (geared towards women physicians), she booked a “friend of a friend” who was directly interested in her niche. When I started the DYEB podcast, most of my audience was personal finance bloggers (carried over from my previous blog), so who did I target? Non-newbie PF bloggers on the Rockstar Finance Forums (sorry J$). 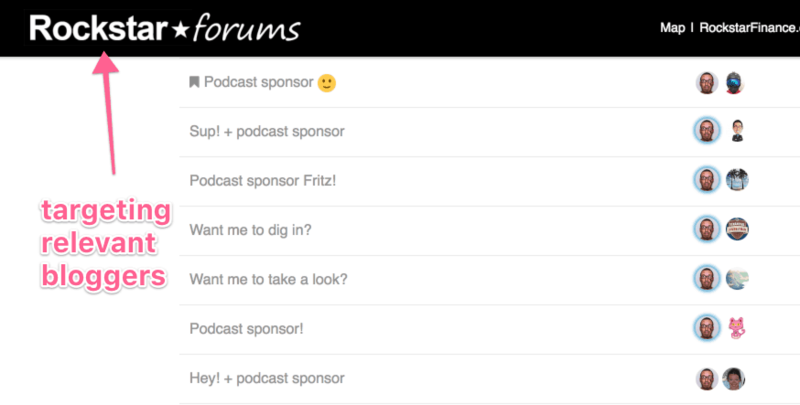 How Much Should You Charge for Podcast Sponsorships? It depends on one thing: your ability to add unique value. This can make it difficult to land on a fee, but I’ve put together a baseline below. These are all based assuming you provide multiple services in addition to just a live-read! Example 1 = Brand new podcaster w/ no existing audience in a standard niche (travel, personal finance, blogging). $50-75 an episode. 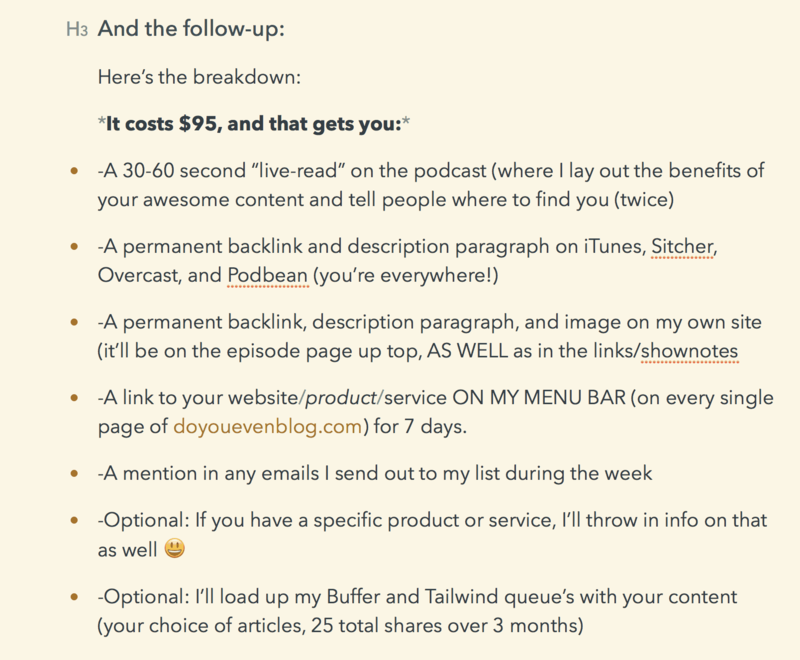 Example 3 = Podcaster in month 9 w/ 300-500 downloads per episode and an email list of 500 people who are LOYAL. $125-150 an episode. Example 4 = Podcaster in month 12 w/ 700-1,000 downloads per episode and an email list of 1,200 people who are LOYAL (Hey that’s me!). $200-300 an episode. FORGET CPM models. Add more value than live reads. Step 3 – Customize & Craft the Pitch. You will get rejected. Plan on it. Embrace it. WELCOME IT. Huge Important Bold Text: Your primary goal when pitching people for anything is to build a relationship. The actual sponsor/deal is of secondary importance. Friendships are 10x more valuable in the long-term. 1 – DO keep it short and sweet and to the point. Nobody likes their time wasted. If the email takes longer than 8 seconds to read, it’s too long. 2 – DO ask permission to pitch them first. Straight to the point–I run the Do You Even Blog podcast, and I have a pitch I’d love to run by you. Valuable relationships are built on trust. Send 1 follow-up. Maybe 2, if spread out over enough time (a month or so). 5 – DON’T be clever. Have a personality, but be a professional. Want my sponsorship and pitch outreach templates? These emails made me several hundred dollars in the first few months–with a TINY podcast. in exchange for your email address. Thank you for sharing this. I am set to start a podcast for Sustainable Lifestyles and Travel this Summer @thepowersofher.com and have been so nervous about the move…this was a VERY informative article. Well done and thank you again. Do you have any tips for a first timer? My 10-second tip: Start knowing it’ll stink at first & will be tough to grow—but it’ll get easier if you can stick with it!